I've been trying to arrange a review unit from Haier for at least a year and a half. 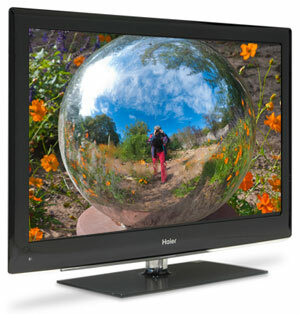 Finally the stars aligned and they sent me the HL40XSL2, the 40" model from their 2010 line of edge-lit LED LCD TVs. Though perhaps not the first name that pops into your brain when you think of TVs in the U.S., Haier, which is based in China, is the fourth largest whitegoods manufacturer in the world, selling a range of products from washing machines to wine coolers. If you are familiar with today's TV manufacturing process, you know that many of the technologies that go into a display are not proprietary to one company. Haier has tapped into one of the most promising TV trends, LED backlighting. Of course, using LEDs to backlight LCD displays does not guarantee a TV with good picture quality. But the more time that I spent with this 1080p 120Hz HL40XSL2, the more I appreciated its performance, which compares favorably with some of the more well-known brands. When it comes to features, this series from Haier departs from the herd by not including any Internet connectivity functions - no Yahoo widgets, no Netflix, no YouTube or Pandora. But they have added one item that I have not encountered on any other TV. Their Time Shift temporarily stores DTV (digital TV) programs onto a USB drive (inserted into the TV's USB port), allowing you to Pause, Rewind, or Fast-forward the program you are watching. The HL40XSL2's video performance is a solid 4.0, leaning towards 4.5 - what I have come to expect from a good LED edge-lit TV. But once again, a TV's audio performance drags it down. For normal TV viewing, the sound quality is fine, but if you try to pump up the volume, the distortion is noticeable. I give Haier credit for the four HDMI inputs and the USB port. But Internet connectivity is becoming de rigeur for this year's TVs and the HL40XSL2 does not offer that feature and any of the Internet providers that are part of that package. Then again, if you simply desire a good old TV with up to the minute LED backlit technology, then this Haier fits the bill. I also give it extra credit for its Time Shift feature. With no Internet connections to fiddle with, you should be set up and watching TV after some minor tweaking of the picture settings. 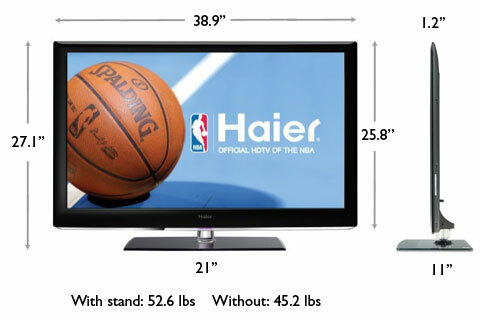 At the MSRP of $1199, the 40" Haier HL40XSL2 is a little pricey, even for a 120Hz LED edge-lit TV. But I'm finding this model on the Internet at much more attractive discounts. If you find it below $1000, add a half point, below $800, make it five stars. I haven't mentioned yet that the HL40XSL2 is only 1.2" thin. That wafer thin number was headline material last year and it's still remarkable. But with LED edge-lit TVs, these double stack pancake dimensions are becoming commonplace. By adding a rather wide two inch glossy black bezel around the sides and top, the Haier designers did not try to accentuate the minimalism of the screen's depth. And the over three inch black bezel at the bottom adds to its solid presence. Though a slight tranparent edge on the bottom ties in with the transparent neck of the stand to give the illusion that the screen is floating. The TV swivels on its stand about 30 degrees forward and backwards, which makes placing it easier. The screen's anti-glare surface does a fairly good job of softening and minimizing reflections. And I found that the picture did not appreciably wash out when I stood too far off center, either from side to side or above or below. This effect on many other LCD TVs has been much more noticeable. On the right front edge, the operational buttons are very subtly situated. Hardly visible, when you roll over them with your finger, they quietly beep to let you know that you engaged them. Around back, on the left, are the two connection panels, one is facing sideways, the other is pointing down. The vertical panel includes two HDMI inputs, one Component Video In (with a matching stereo Audio In), one digital optical SPDIF Audio Out, an RF Antenna in, one Headphone out and one USB port. I have turned this Side panel on its side to fit the screen. The lower panel provides two more HDMI inputs, one VGA PC input with an Audio In (stereo minijack), one more Component Video In (with a matching stereo Audio In), one Composite Video In (with a matching stereo Audio In), and one analog stereo Audio Out. I assume to save real estate, Haier has combined the traditional three RCA connectors, used for the Component Y, Pb, Pr inputs, into one triple-headed minijack. The usual L and R RCA connectors for audio are combined into another minijack. 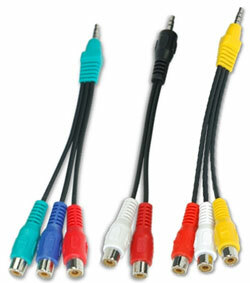 And the Composite video and audio cords are fused into a red, white and yellow triple minijack. In the box, Haier includes these adapter cables. As I have mentioned, the HL40XSL2 does not connect to the Internet, therefore it does not have a LAN port or a built-in wireless adapter, which means that you won't need to worry about connecting to your home network. The USB port serves a double function. Like many other TVs these days, you can load a USB flash drive full of images, music or videos, plug it into the TV's USB port and play the files back on the screen. The manual states, "Supporting media and file format: Digital pictures (.JPG/.JPEG/.BMP(Baseline & Progressive)/.PNG), digital music (.MP3 [8~320kbps]) and Video(.avi/.mpg/.mpeg/.vro/.vob/.ts coded with MPEG-1 or MPEG-2 standard) files." The Photo menu offers seven transition effects including a funky looking dissolve that breaks up into little squares. You can choose from three duration speeds, Slow (about four seconds), Medium (about 7) and Long (about 10). You can't adjust Picture controls when you are in the Photo menu. I wish you could. The Audio playback display is basic though you can spice it up by turning on the Audio Spectrum feature, which gives an interactive graphic equalizer look. Once again, you cannot adjust Audio controls while in the menu, but you can activate the Audio Only setting, which turns off the video display and just plays audio. This is a great energy saver if you simply want to listen to music. I found no way to add music to a slideshow. The unusual function for the USB port is Haier's Time Shift, which uses the inserted USB drive as a temporary storage device. Basically, if you are watching a DTV channel, Time Shift will store the program as it is playing, up to the capacity of the USB drive. You can then pause, rewind or playback that program. If you change channels or turn the TV off, the previous program cannot be accessed. Time Shift has its limitations. First, it only works with DTV content, which is over the air programming coming through an antenna. That precludes content from a set top box or a DVD player. I ran into a hurdle when I tried to test Time Shift. First, the USB drive must be formatted in Fat32, which is easy enough to do. Then the drive has to be at least 1GB, which is not a major obstacle since I have accumulated a number of flash drives from past conferences and many are 1 gig. But I discovered that the TV is picky about that 1GB figure. Once I formatted the drive, the remaining 980MB was too small to pass muster. So, I dug a little deeper into my drawer and found a 4GB drive and formatted it. 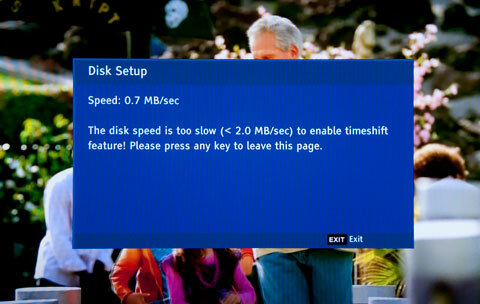 Alas, after inserting it, the TV ran a speed test and rejected it because it was too slow. The manual does say that the TV, "Supports USB/Memory Card Plug & Play (don't need to reset TV system), USB Hard-drive support - only support the class of USB HD that follows USB power consumption spec." I tried a USB hard drive with no success. I figured that it must be incompatible. Therefore, I am currently out of luck. That by no means indicates that Time Shift does not work. I just would need to purchase a fast compatible USB drive. If you go shopping for one, Haier states that a 2GB USB drive would hold 15 minutes of HD content recorded by Time Shift. Doing the math you would need 8GB for a 60 minute program. The shiny black non-backlit multi-function remote is clearly labeled and the buttons are well-spaced and logically placed. The manual is descriptive but not always informative. For example, in the Advanced Video menu, there's an item called Blue Stretch. I've never encountered a Blue Stretch setting before and the manual was no help. All it offers is, "Blue Stretch: To set Blue Stretch: On and Off." On May 1, 2010, the EPA implemented Version 4.1 of the ENERGY STAR Program Requirements for TVs. They are now publishing a list of TVs that that meet this stricter standard. (You can find it here.) The Haier HL40XSL2 is not on the list. We decided to take our own measurements at different stages. To measure power, we hooked the HL40XSL2 up to our watt meter, called Watts up? Pro, and took a reading during playback of a Blu-ray movie and another in standby mode. 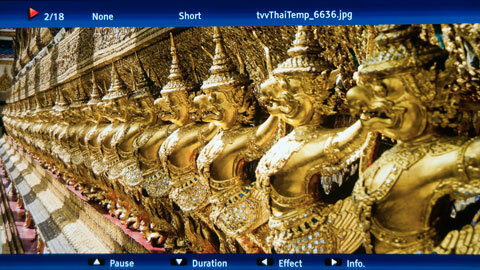 During playback of a Blu-ray DVD, the meter ranged between 135 and 137W. (The Maximum On Mode Power for a 40" TV to qualify for an Energy Star 4.1 is 107W). The TV does not have a Backlight setting that can change power consumption. I have customized the Picture settings and I figure that they are medium to low in power usage. When I powered the TV off, the meter dropped like an anchor to 0W and stayed put. The qualifying standard is less than 1W. You need to check your electric bill to see how much you are paying for a kWh. The rate that I have been using in previous reviews is 10.4 cents. Doing the multiplication, at that rate, the yearly energy cost is $27.98. Since from our measurements, the HL40XSL2 is just outside of the Energy Star 4.1 requirements, you know that all the 40" models on the Energy Star list are more energy efficient. To calibrate the TV, we use two discs, the Blu-ray version of the Digital Video Essentials DVD called HD Basics and the Spears & Munsil High Definition Benchmark Blu-ray DVD. We are playing the DVDs on the Sony BDP-S570 Blu-ray player connected to the HDTV with an HDMI cable. We use the test patterns to adjust black level, white level, and color bias. The player is set to output a 1080p signal, which is the native resolution of the HL40XSL2. Haier provides four Picture Modes: Standard, Vivid, Mild, and Custom. Even if your fingers are itching to tweak , I always suggest that you chill for a moment. Pick one of your favorite movies or programs and test out the different Modes. Who knows, you might fall in love with one and then you can start nuzzling with your TV immediately. With this Haier, I was surprised that the Vivid setting was so subdued. Usually Brightness and Contrast are cranked up, but not on this unit. Though I did notice that Sharpness and Color were higher than I like. A note in the manual tells you that Vivid, Standard and Mild are fixed presets and you can not adjust controls like Brightness or Color Temperature. Therefore, if you decide that you twitch to tweak, you need to choose Custom, like I did. I then turned to Color Temperature, where there are three options, Cool, Standard and Warm. I picked Warm. To each his own. I also searched around and could not find a Backlight control, which is unusual for LCD TVs. I then opened the Advanced Video menu and checked that Adaptive Luma Control, Flesh Tone and Blue Stretch were turned off. After you finish the initial setup, you can go back and experiment with them. Also, for now, go into MJC (Motion Judder Cancellation) and turn it off. We will revisit it later. I returned to the Picture menu. According to the test patterns, moving Brightness one notch up was not quite right but two notches was a wee too much. I lowered Contrast four clicks. I reduced Color (Saturation) even more to about 40 (on a scale of 0 to 100). The test patterns said to slide Tint (Hue) a few clicks towards Green. My eye insisted that skin tones were still too red and I nudged the Tint slider a little more towards Green. I could see fringing around lines until I dropped Sharpness to about 10. I am not a sharpness fan and there it stayed. We're finished. I guess if you want to fiddle, you could open up Color Temperature and individually adjust the Red, Green and Blue sliders. Though I would recommend against it. Other than that, experiment with the Adaptive Luma Control and click Blue Stretch on and off just because it's there. I have a tendency to tread lightly with controls like MJC because they can make the picture look too sharp and too video-like to me. While other viewers love this look. In the MJC menu, Haier provides a side by side demo mode with 120Hz Motion on and off. See what you think. If I engage MJC at all, it's usually the Low setting. 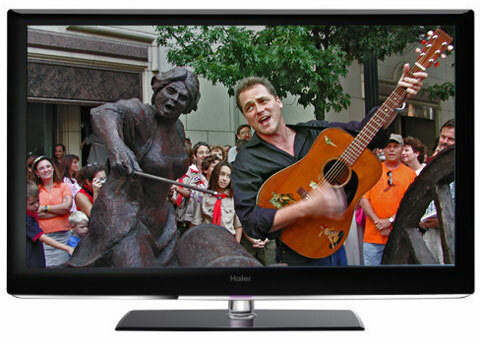 The picture quality of the HL40XSL2 is very good, which is what I have come to expect from edge-lit LED LCD TVs. The blacks do not compare to the deep deep ones from the better plasmas or even direct-lit LEDs. The picture that I dialed in with my settings appealed to me because it was soft and subdued - more film-like. Of course, if you lust for the gusto, you can pump up Saturation and Sharpness and flex Adaptive Luma Control. With some other edge-lit LEDs, I have noticed that the light dispersion across a dark screen was uneven, with brighter regions around the edges. This Haier produces a much more consistent light pattern. Audio quality, with normal TV viewing, is satisfactory, about what you would expect from a tiny pair of integrated speakers. But when I started to stress those tweeters, they were just not up to the task. For example, when I raised the volume on the Dave Mathews & Tim Reynolds concert Blu-ray, the speakers started to rattle and distort. In addition, the TV's Audio menu provides Equalizer options like Rock, which also tended to cause unwanted artifacts. I think that you would gain a greater appreciation of the HL40XSL2 if you plugged an optical digital cable from the TV's SPDIF audio out into a soundbar. Or take it a step further and use a dedicated A/V receiver and speakers. 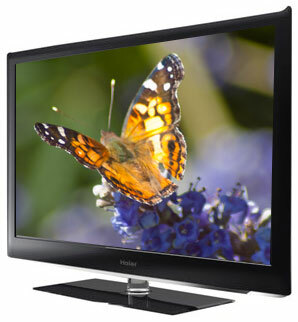 The 120Hz, 1080p LED edge-lit Haier HL40XSL2 LCD TV produces a highly satisfactory picture in a slender 1.2" package. It doesn't offer network connectivity and the accompanying Internet content, but it does include a unique DVR-like Time Shift feature through the USB port. I never have gotten time shift to work and this was a major reason I went with this no-name Fry's special. ???? ???? ????? ????? ?? ??? ?????? ??????? ?- ?????? ??? ????? ?????? ??????? ???? ????? ???? Based on your review i decided to purchase this tv and i have to say ITS HORRIBLE, i`m a huge gamer so the 120HZ, 800,000:1 contrast 1080p seemed amazing esp with 4 HDMI. GUESS WHAT it was not. I put in GTA 4 and immediately it was blocky looked like lego pieces, regardless how what setting i tried nothing worked. I even changed the HDMI and used component and still the same.